Americans should be wary lest they get in between Big Pharma and a buck. That’s what investigators for a U.S. Senate subcommittee showed when scrutinizing how industry middlemen inundated the Show Me State with more than a billion doses of powerful prescription painkillers, making big profits but asking few questions how so many opioid drugs could be taken by so few patients. It’s also what patients might see as drug makers retreat from research to develop needed new antibiotics and therapies for Alzheimer’s and Parkinson’s. Let’s look first at the minority findings by investigators from the U.S. Senate Homeland Security and Governmental Affairs Committee in its continuing probe of the opioid crisis. The group’s latest report details how McKesson and AmerisourceBergen, two leading drug distributors, shipped “nearly identical volumes of opioids to Missouri between 2012 and 2017: roughly 650 million doses each,” said Stat, the health and medicine information site. The two companies, while raking in big money from drug distributions, took two different views about suspicious transactions, even as they flooded Missouri, a state with just slightly more than 6 million people, with the equivalent of 260 opioids per person. McKesson flagged for federal regulators from the Drug Enforcement Agency 16,714 suspicious cases. AmerisourceBergen raised concerns in just 224 cases. In either case, a Redskins fan running around FedExField in a light rain had a higher statistical likelihood of getting hit by lightning than a drug dealer might have had in getting singled out by Big Pharma distributors for receiving huge, illicit opioid shipments. 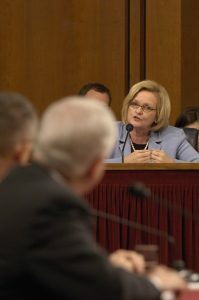 Which also has raised concerns by Sen. Claire McCaskill, the top Democrat on the Homeland Security and Governmental Affairs Committee. She’s from Missouri, and, yes, she’s seeking reelection in what looks to be, again, one of the most hotly contested Senate races in the upcoming midterm elections. McCaskill has castigated not only Big Pharma players but also the DEA for their roles in fueling the opioid crisis, not just nationally but specifically in Missouri, which recorded more than 950 opioid deaths in 2017, roughly 1 in every 65 of all deaths in the state. Based on what committee investigators found, she has asserted that federal law enforcement agencies focused more attention in the opioid crisis on small-time drug criminals rather than big players, like drug makers and distributors. That, of course, may be due to other factors, such as the Washington Post’s reporting that Big Pharma quietly but effective hired away top DEA officials to lessen law enforcement and regulatory interference with the industry’s making billions of dollars off sales of powerful and highly addictive prescription painkillers, including the wallop-packing, synthetic drug fentanyl. The Washington Post and “60 Minutes” also reported that DEA lawyers may have been intimidated by Big Pharma’s big spending, defense lawyers and their capacity to fight long, tough battles against opioid fines or prosecutions. Amerisource Bergen and McKesson, denying any wrongdoing, have negotiated and paid fines rather than fighting with Uncle Sam over what they did or didn’t do in the opioid crisis. McKesson settled for $150 million, Amerisource Bergen agreed to $16 million. The US Justice Department has offered up a complex system that it says will tackle deficiencies highlighted in McCaskill’s criticisms, factoring in distribution diversions as part of “quotas” to be imposed on firms wishing to make prescription painkillers. That plan has been poorly received by critics and industry supporters alike. US Attorney General Jeff Sessions, meanwhile, has announced a new crackdown on criminals who peddle fentanyl, a drug increasingly implicated in fatal overdoses nationwide. He said he will increase prosecutorial staffing in 10 areas of the country hard-hit by illicit fentanyl trafficking, including Ohio, Tennessee, Kentucky, West Virginia, Maine, California and Pennsylvania as well as in New Hampshire. Just how much money do opioids generate for Big Pharma? One big such drug, OxyContin, generated for Purdue Pharmaceuticals $1.8 billion in 2017, down from $2.8 billion in 2012. In 2013, Insys, the maker of a form of fentanyl administered under the tongue, reported revenues of $330 million and a profit of $58.5 million — this was before legal charges and questions began to swamp the firm. In my practice, I see not only the harms that patients suffer while seeking medical services but also the havoc wreaked upon them, their lives, and loved ones by ever more costly and dangerous drugs. It’s unacceptable to see the slow roll-out of increasing evidence on how Big Pharma, doctors, insurers, and hospitals abetted the opioid crisis that kills more than 115 Americans each day through overdoses. The players who got us into the mess, as well as lawmakers and policy wonks, need to step up and take strong action to get us out of it. Meantime, many of these same folks need to open their eyes to what’s occurring with unchecked Big Pharma profiteering and the industry’s unwillingness to take anything less than the maximum buck on drugs, even though there may be dire needs. Patients worldwide, due to abuse and overuse, face a significant threat to global health from growing antibiotic resistance and over-use and abuse of aging, infection-fighting medications. This could lead to preventable deaths of hundreds of millions and unnecessary costs in the trillions. Big Pharma, which has the billions of dollars, expertise, and experience to research and develop new germ-eradicating drugs, isn’t finding this work easy nor fast. And, without the prospect of quick money, drug companies are leaving the public vulnerable by pulling out of antibiotics R&D. Similarly, Big Pharma, notably industry giant Pfizer, is withdrawing from developing therapies for Alzheimer’s and Parkinson’s, two progressive and debilitating disorders that already afflict millions in this country and will do so for increasingly large populations of our ever-graying nation. Drug makers haven’t found fast magic in dealing with these conditions, either, and without easy profits, they’re pocketing R&D expenses here to enrich the companies and their shareholders — so much for all the rest of us. Sure, drug and health care economics are complex matters, and oversight and regulation of the industry is a tough, complicated matter. But Big Pharma’s relentless pursuit of the almighty buck isn’t hard to see, witness how Pfizer purportedly eased up on its clock-work like price increases on dozens of its products after jawing from the Trump administration. Look closely, though: the company didn’t say it wouldn’t jack those costs up. It will just wait to do so until there’s less heat and attention.